A real alternative to a conventional water softener at a fraction of the price. Easy DIY fit - no plumbing required. Just wind two coils of wire around your incoming water pipe and switch on. The Eddy water descaler uses electromagnetic waves to reduce effects of the calcium, magnesium and manganese salts in hard water, otherwise known as "limescale". It alters the form of the calcium and magnesium crystals in solution to a softer, less harsh and corrosive type which is much less likely to adhere to taps, basins, toilets, boilers and pipework and can be flushed harmlessly away with your normal waste water. Unlike a conventional water softener, no extra water is used and no harmful deposits are flushed down the drain. Do you suffer from the curse of limescale in your household water system? 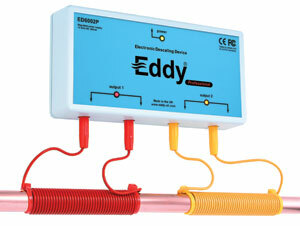 You need the Eddy Electronic Descaler. How to purchase the Eddy scale Inhibitor? - You can order online using our secure online ordering system or call us free on: 08000 337 337 for next day delivery by Royal Mail Special Delivery (UK only - other countries by Airsure International Airmail). The purchase of your Eddy water softener alternative is totally risk-free as we stand totally by our product with our famous "complete satisfaction or your money back" 12 month money-back guarantee. Water softeners lessen the magnesium, calcium, manganese and ferrous iron in hard water. These "hardness ions" cause the all too familiar effects experienced by those who suffer from hard water. Most visibly, metal ions (yes, calcium is a metal) can have a reaction with soaps, resulting in the "bathtub ring". The Presence of "hardness ions" also hinders the waters ability to clean when combined with detergents. Secondly, calcium & magnesium carbonates can form into hard deposits settling on the surfaces of pipes and heat exchanger surfaces. The ensuing buildup can create blockages, restricting the flow of water in pipes. In boilers, these blocks can hinder the flow of heat into water and cause the boilers themselves to over heat. This can often cause your boiler to fail prematurely. Eddy can reduce the damage caused to many common types of boiler (see FAQ section). Thirdly, ions present in hard water, can also result in galvanic corrosion, in which one metal will corrode when interracting with a different metal type, when both are in contact with an electrolyte. This is commonly seen when your hot water storage cylinder springs an unexpected and unwelcome leak. Salt is the usual active ingredient used in a conventional water softener. Not only do water softeners consume large amounts of salt at considerable ongoing cost, the waste water from flushing the device is flushed down the drain, increasing your water bill and adding eco-unfriendly sodium salts to the waste water. Eddy avoids all of the problems of a conventional salt-based water softener and doesn't need a plumber to fit it. You can do it in 30 minutes! 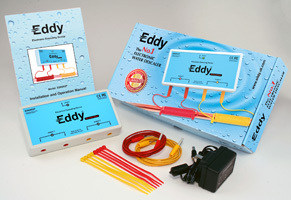 Eddy is the cost effective and environmentally friendly solution to your hard water problems.